Do you have pumpkin everything on the mind? We do because my son Benny loves pumpkins. I mean, not to eat, but to spot on people’s doorsteps when we’re driving around. He starts screaming, “PUMPKIN! MOM PUMPKIN!” To which I have to reply, “Yes, Ben, look at those cool pumpkins,” in order to stop his frantic yelling. But he does like to eat these pumpkin spice waffles, which I’m really glad about. Because he doesn’t like to eat hardly anything right now. I love the cool fall weather, but I’m hoping the temps stay above freezing this weekend because I’m packing for a river trip right now! I’m going on Desolation Canyon with just my mom, dad, and me. Fun, eh? My parents are seriously cool peeps. Would you enjoy a trip with just your parents? I use One Degree Sprouted Flour for these waffles, but regular old whole wheat flour will work well too. 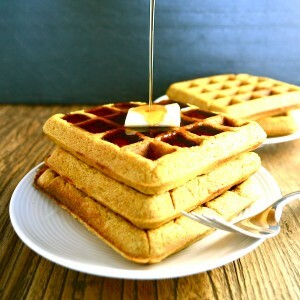 Really any grain-based flour I’ve tried has worked with these waffles–they’re pretty forgiving. I like Rumford aluminum-free baking powder and Real Salt. And I use Farmer’s Market Organic Pumpkin. I almost always double this recipe and freeze the leftover waffles to eat later. 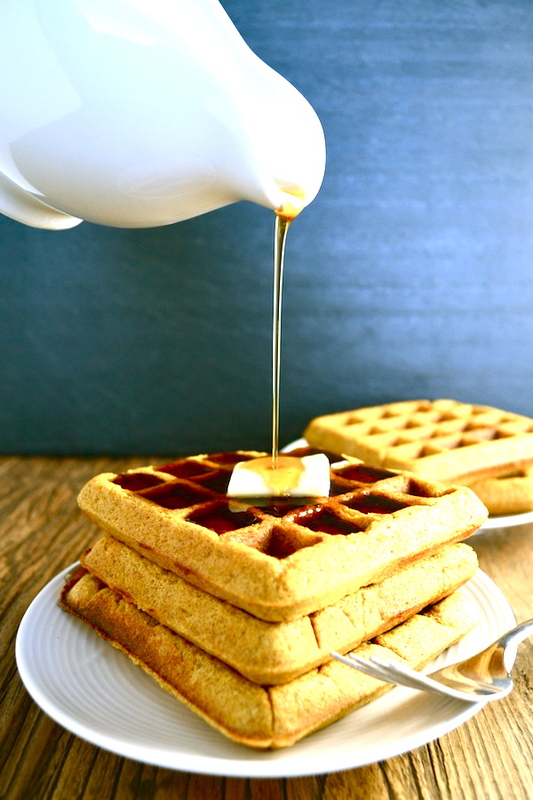 Read about how to freeze homemade waffles here. They have just the right amount of pumpkin and spices to add some fall flavor, but they’re not overpowering. Top with some butter and maple syrup for a delicious fall breakfast! Mix the flour, baking powder, salt, and spices in a large bowl. In a separate bowl, combine the milk, pumpkin puree, eggs, and applesauce. Pour the milk mixture into the dry ingredients and stir briefly. Combine the butter, maple syrup, and vanilla together. Pour the butter mixture into the other ingredients and mix until well combined. 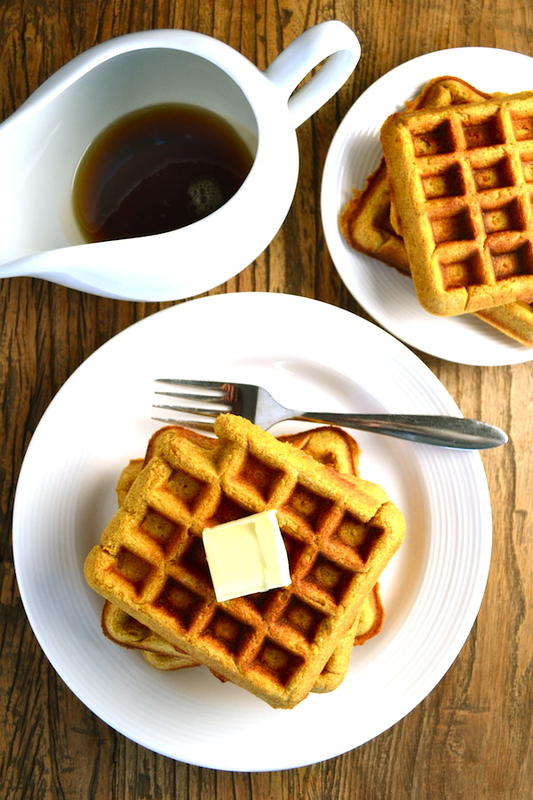 Scoop batter onto waffle iron and cook waffles. Serve immediately with pastured butter and real maple syrup. Disclaimer: Some of the above links are Amazon affiliate links, which means if you click on them and purchase a product I will earn a commission on that product with no extra cost to you. I have used all of the products listed and I highly recommend them.